Fond memories of brisk Fall days and an abundant harvest with this keepsake log cabin. 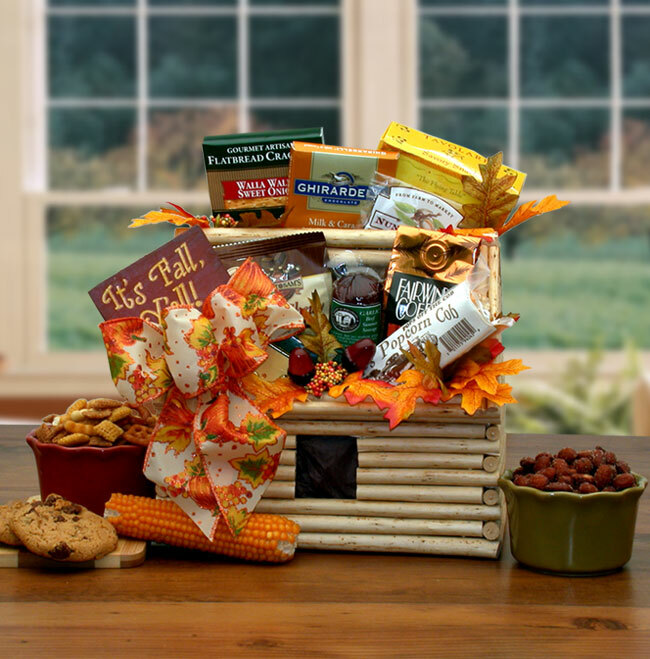 It is brimming with Fall favorites like Harvest Coffee, smoked almonds, chocolate chip cookies and more. They'll be thankful for your selection of this delicious gift! The basket includes Pine log cabin planter, Ghirardelli caramel filled milk chocolate bar, 3 oz summer sausage, Harvest flavored coffee" a sweet blend of spice and pumpkin, Brent & Sams chewy chocolate chip cookie, Nunes smoked almonds, Brie cheese spread, Tavolare sweet n salty snack mix, Rosemary and sea salt crackers. Decorated with fall leaves and topped with a handmade bow and It's Fall Y'all card this gift measures 10" long by 8" wide and 13" tall. The completed gift weighs 4 pounds.